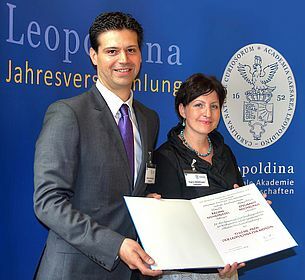 Two young researchers are this year's winners of the "Thieme price of the Leopoldina for medicine." Regine Mühlfriedel and Stylianos Michalakis receive the prize worth 15,000 euros for her work in the field of gene therapy in inherited retinal degenerations of the eye. The National Academy of Sciences "Leopoldina" awards the prize jointly with the Thieme publishing group. Mühlfriedel and Michalakis have achieved together highly relevant scientific results within an interdisciplinary research team funded by the German Research Council. The tile of the project was "Evaluation of the effectiveness of local gene therapy in CNG channel-deficient mouse models of inherited retinal diseases". Core of the work is the successful gene therapy of two important diseases from the spectrum of inherited retinal degenerations, which can lead to blindness in advanced stages. 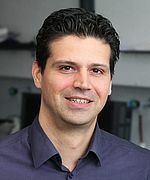 Michalakis has developed the therapeutic viruses in both projects, whilst Mühlfriedel treated mouse models at the Research Institute of Ophthalmology in Tuebingen. Retinitis pigmentosa (RP) is a group of genetically heterogeneous, severe retinal diseases commonly leading to legal blindness. Mutations in the CNGB1a subunit of the rod cyclic nucleotide-gated (CNG) channel have been found to cause RP in patients. Here, we demonstrate the efficacy of gene therapy as a potential treatment for RP by means of recombinant adeno-associated viral (AAV) vectors in the CNGB1 knockout (CNGB1(-/-)) mouse model. To enable efficient packaging and rod-specific expression of the relatively large CNGB1a cDNA (~4 kb), we used an AAV expression cassette with a short rod-specific promoter and short regulatory elements. After injection of therapeutic AAVs into the subretinal space of 2-week-old CNGB1(-/-) mice, we assessed the restoration of the visual system by analyzing (i) CNG channel expression and localization, (ii) retinal function and morphology and (iii) vision-guided behavior. We found that the treatment not only led to expression of full-length CNGB1a, but also restored normal levels of the previously degraded CNGA1 subunit of the rod CNG channel. Both proteins co-localized in rod outer segments and formed regular CNG channel complexes within the treated area of the CNGB1(-/-) retina, leading to significant morphological preservation and a delay of retinal degeneration. In the electroretinographic analysis, we also observed restoration of rod-driven light responses. Finally, treated CNGB1(-/-) mice performed significantly better than untreated mice in a rod-dependent vision-guided behavior test. In summary, this work provides a proof-of-concept for the treatment of rod channelopathy-associated RP by AAV-mediated gene replacement. Congenital absence of cone photoreceptor function is associated with strongly impaired daylight vision and loss of color discrimination in human achromatopsia. Here, we introduce viral gene replacement therapy as a potential treatment for this disease in the CNGA3(-/-) mouse model. We show that such therapy can restore cone-specific visual processing in the central nervous system even if cone photoreceptors had been nonfunctional from birth. The restoration of cone vision was assessed at different stages along the visual pathway. Treated CNGA3(-/-) mice were able to generate cone photoreceptor responses and to transfer these signals to bipolar cells. In support, we found morphologically that treated cones expressed regular cyclic nucleotide-gated (CNG) channel complexes and opsins in outer segments, which previously they did not. Moreover, expression of CNGA3 normalized cyclic guanosine monophosphate (cGMP) levels in cones, delayed cone cell death and reduced the inflammatory response of Müller glia cells that is typical of retinal degenerations. Furthermore, ganglion cells from treated, but not from untreated, CNGA3(-/-) mice displayed cone-driven, light-evoked, spiking activity, indicating that signals generated in the outer retina are transmitted to the brain. Finally, we demonstrate that this newly acquired sensory information was translated into cone-mediated, vision-guided behavior.